We have an intimate relationship with sugar; its taste often evokes sweet personal memories. Yet in her painting, Agatha Barton III, Andrea Chung imbues sugar with a resonance far beyond the family kitchen. For Chung, sugar and spice, its twin ingredient, evoke memories bitter and sweet, epic and familiar: Houston, her childhood home, and the colonial West Indies, the Caribbean island home of her ancestors. 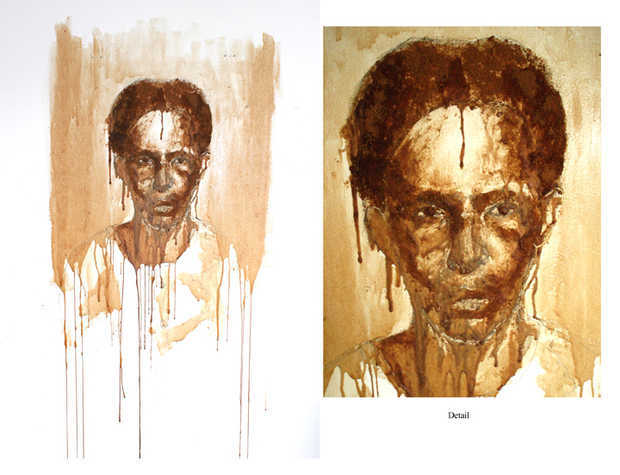 Chung paints a portrait of her grandmother, who lived in the West Indies, and mixes sugar into her paint medium. Many people identify cane sugar with the Caribbean, but colonizers imported it from India, its native land. Slaves and indentured laborers sent to the Caribbean worked in service to imperial economics afforded by sugar. “Sugar contains the history of the Caribbean and with it, the history of cane plantations, slavery, indentured servitude, the history of rum and piracy and on a more personal scale, the history of black cake and tamarind balls and the history of family gatherings and holiday sweets and dessert,” Chung says. In Agatha Barton III, medium and meaning intersect. Unlike many Western figurative painters, such as Jan Van Eyck or Vermeer, Chung’s paint does not purely create an illusion of other surfaces and textures: jewel-like, light as fabric, smooth as enamel. In the West Indies, cultures intermingled like the ingredients of a flavorful dish. Similar to other members of the nomadic Hakka people of China, Chung’s paternal grandfather left China for economic opportunity; he came to Jamaica as a stowaway on a boat. Meanwhile, Chung’s paternal grandmother was from the West Indies. Chung notes that Chinese laborers were denied immigration to the United States by an act of Congress in 1882, and that in part most West Indian Chinese owe their legacy to this exclusionary act. Many men and women in the West Indies are now prone to diabetes and fibroid tumors, perhaps because of the omnipresence of sugar in their diet. Chung herself has also suffered deleterious health effects related to this genetic legacy. The story of sugar, that glittering good packed away in cane fields and baked into so many Caribbean dishes, quietly becomes a human story. Other edible goods tell the same story, such as the curry brought over from South Asia to the West Indies, with its mellifluous blend of spices: coriander, tumeric, and cumin. Each spice tells us a story in its own voice, and ultimately food becomes the currency common to our bloodlines. In her art, Chung reveals how the past can visit us even with our eyes closed—maybe in a spoonful of curry—its taste and smell pleasing and powerful, its rich, familiar nature at once embodying past, present, and future. Andrea Chung was born in Newark, NJ 1978, and raised in Houston, Texas. She received a BFA at Parsons School of Design in New York and a MFA at the Mount Royal School of Art at the Maryland Institute College of Art in Baltimore, Maryland. She also attended the Skowhegan School of Painting and Sculpture in 2008 and was a recipient of a 2008-2009 Fulbright Scholarship to Mauritius. Chung’s work as has been featured in the NEXT exhibition at Art Chicago, Off Color, curated by Hank Willis Thomas and Kalia Brooks at RUSH Arts, ACADEMY 2008 at the Conner Contemporary in Washington, D.C., the Arlington Arts Center in Virginia, the Sonya Hayes Stone Center at UNC Chapel Hill curated by Pamela Phatsimo Sunstrum, the Gateway Gallery at the Maryland Institute College of Art as part of Transformations, the 3rd Annual Conference on African American Art hosted by MICA’s Center for Race and Culture and Harvard University. Her work was featured in the academic journal, Small Axe and was most recently displayed at Le Flash in Castleberry Hill in Atlanta, Teachers College at Columbia University and in the 2009 Verge Art Fair at Art Basel. This entry was posted on Monday, January 25th, 2010 at 8:00 pm	and is filed under Art. You can follow any responses to this entry through the RSS 2.0 feed.